"All I'm asking is that you clean up once in a while." Grogmar gro-Burzag is an Orc miner that lives at Shor's Stone. He lives with fellow miner Odfel and will buy iron ore from you. He states he has been a miner his entire life and can smell ore. Like most Orcs he seems hardened, but never really unfriendly. He will act warmly towards you after you clear the mine. Grogmar starts off his day by waking up at 5am and spending two hours resting in Odfel's house. At 7am, he heads off to Redbelly Mine to start work. He works at the mine for most of the day, tirelessly mining for eleven solid hours. At 6pm, he finally stops working and goes home to rest for an hour. At 7pm, he goes to the campfire in the middle of town. He spends four hours sitting around the fireplace and sometimes using the cooking pot. At 11pm, he heads back home to sleep for six hours, and repeats his schedule the following day. Grogmar wears a set of miner's clothes along with a pair of boots. He carries a pickaxe, a belted tunic, a key to Odfel's house, and a selection of common loot and gold. 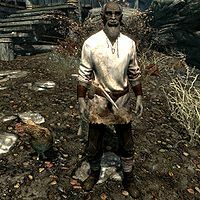 Grogmar definitely believes that he is a very experienced and skillful miner, stating, "You're looking at the best miner in Skyrim. He will then back up this claim: "I'd wager I could crack rock faster than anyone. Even you." He will then stop boasting and talk about the difficulty of mining: "Takes a lot of strength to swing a pick axe, know what I mean?" He may see that he is not coming off as too friendly and will then say to you, "Aye, I see the look you're giving me. Don't worry, I won't bite." After you take care of the spiders in the mine, he will be quite happy and tell you, "Ha! You showed those spiders a thing or two!" If you ask him to tell you about the mine he will say, "Damn place is filled with this reddish mist. Can't see more than ten feet in front of your face. But when you can sniff out a vein of iron like me, it isn't too much trouble." He will end conversation with you by stating, "May the road favor the foolish..."
Odfel: "All I'm asking is that you clean up once in a while. How you can find anything in your half of the place is beyond me." Grogmar: "I'd rather spend more time in the mine hauling up iron then doing woman's work keeping the house clean." Odfel: "I'll have you know I can haul up just as much iron as you in a day and still manage to clean up my messes." Grogmar: "You think so, huh? 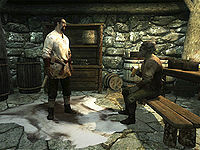 Maybe you'd like to put some septims behind that boast." Odfel: "You have yourself a bet." Selling iron ore to Grogmar will make you Blood-Kin, allowing you to enter Orc strongholds and trade with them. Since iron ore is in such abundance (you can even buy it from Filnjar, the nearby blacksmith, and sell it for more than it cost you to buy it), this makes Grogmar one of the easiest means in the game of achieving Blood-Kinship. This page was last modified on 17 July 2018, at 20:37.